The UCO Swing Club has been around for more than 6 years, reaching hundreds of people, both UCO students and non students. We meet every Thursday night at 8:00 for a lesson and dance. 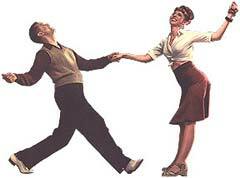 We strive to bring the joy of swing dancing to as many people as possible! We hold free lessons weekly and a workshop at the end of the semester, bringing you the best instruction possible. Come to any lesson for more information! Also, feel free to call or email Chelsea for more info. We're having a Valentines Day Dance on Thurs. February 16. Admission is Free. There will be a quick beginner lesson at 8:00, and dancing until 10:00. We are organizing a carpool (Yay!! Roadtrip!!) to Lindyfest in Houston over Spring Break. You can get more info about Lindyfest at http://lindyfest.hsds.org . There is already a group of people going from Oklahoma, but we're looking for more! Lindyfest is a great event that is celebrating it's 10th anniversary this year. Remember to register as an "affiliate club" from Oklahoma.